Every so often, I like to see what (you) readers of the Tallahassee real estate blog are viewing most, as it provides me with the feedback that I need to guide the future real estate content that is most popular for the people that matter most. I am usually aware of the more popular topics and reports, but occasionally I am just blown away at the choices that our readers make. 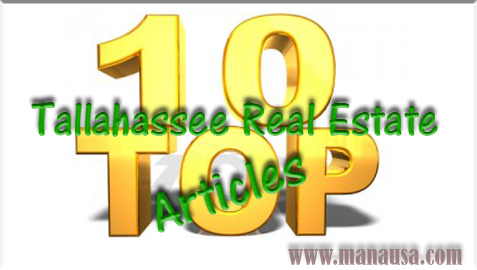 The first article in the top ten list of real estate articles in Tallahassee is a case in point. I had several visitors ask me questions about the unique structure and style of the Tallahassee Real Estate Website, so rather than continue to fire-off email responses, I wrote an article on how to create a top real estate website. This article surprisingly continues to draw hundreds of visitors well more than a year after I wrote it. Number three on the list is one of my favorites, as it is sage advice for home sellers during any market cycle. Even though we are currently in the most lop-sided buyer's market that I have seen, home sellers should read Why Real Estate Is Always A Seller's Market. It shows home sellers how they can control their own destiny, despite what is happening all around them. Finally, a page on the site, not even a regular blog post, has seen a continual growth in visitors who are seeking information about Tallahassee neighborhoods. It contains a list of over 1,300 neighborhoods in Tallahassee, as well as links to articles and a current list of homes for sale in each neighborhood. The Tallahassee Neighborhoods page has become a widely used resource and it will continue to strengthen as more articles are written about each one. The following list shows the most-read articles on our website, as well as the number of visitors each one has received. If you have an idea for a topic that I should cover on the Tallahassee Real Estate Blog, please include it in the comment box below this post. I appreciate the feedback and look forward to providing the best real estate content in Tallahassee!